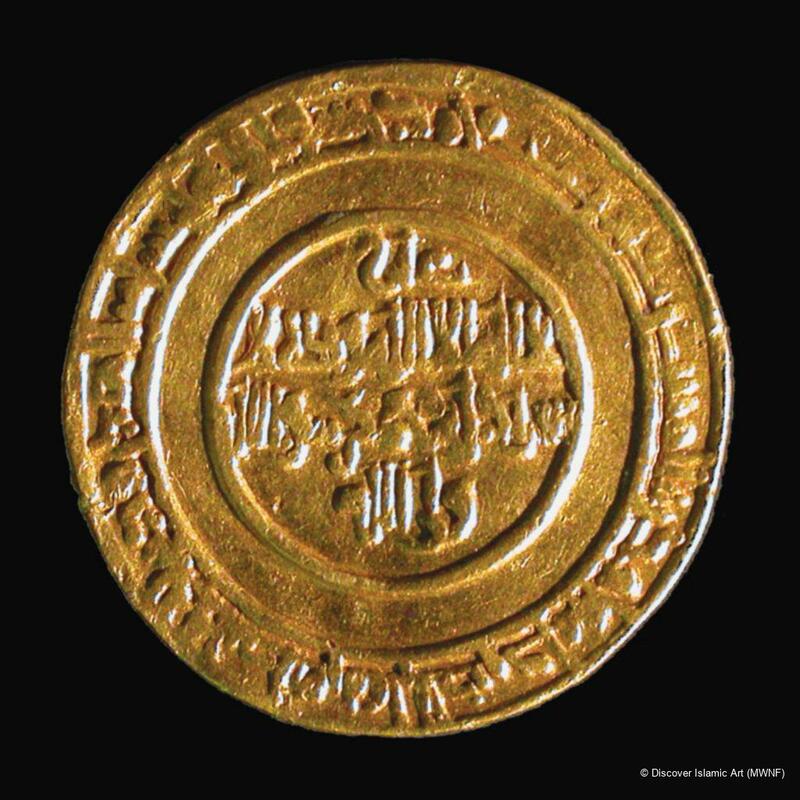 The coin, produced at the Egyptian mint, can be dated to the reign of Abu ‘Ali al-Hakim bi-‘amr Allah (AH 386–411 / AD 996–1021). 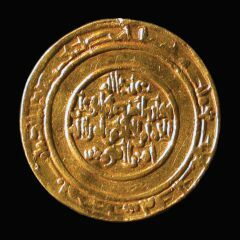 The coin has a four-line inscription with kufic characters on both sides. The inscription on the front reads ‘‘Alî lâ ilâ illâ Allâh wahda-hu lâ sarik la-hu Muhammad rasûl Allâh wâli Allâh’ (‘There is no God but Allah, the One, there is none like unto him. 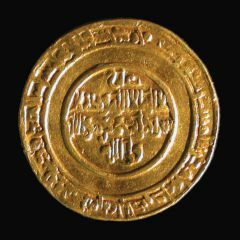 Muhammad is the Messenger of God’) and the inscription around the edge reads ‘Muhammad rasûl Allâh arsala-hu bi-l-hudâ wa al-haqq li-yuzhira-hu alâ al-dîn kulli-hi wa la-hu kariha al-musrikûn’ (‘Muhammad is the messenger of God. He has sent His messenger with the guidance and the true religion, and will make it dominate all religions, in spite of the idol worshipers’). The inscription ‘Abd Allâh wûliya al-Mansûr Abû Ali al-imâm al-Hakîm bi-amr Allâh amir al-mu’ minîn’ appears in the middle of the front side, and the edge bears the inscription ‘bismi-llâh duriba hadâ-l-l-dînâr bi-Mis'r sana talat wa arba maya’ (‘This coin was minted in the name of God in Egypt in the year three and four hundred’). The dinar, which takes its name from its Byzantine predecessor the denarius, is decorated with an inscription in kufic characters. 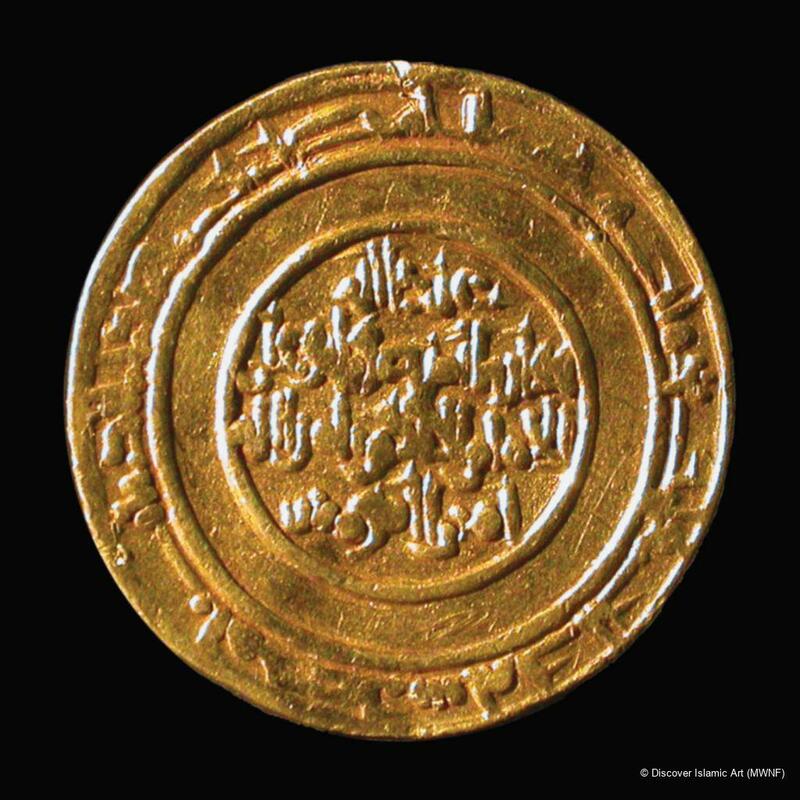 This coin was minted during the reign of the Caliph al-Hakim. Lane-Poole S., Catalogue of Oriental Coins in the British Museum, IV, London, 1879, p.21, fig. 85.